This is a problem I've had for a long time. When I use Firefox in fullscreen I can't move the mouse down to get the taskbar to get o Windows. This wasn't such a big deal when using Windows 7 because I could use the Windows button on the keyboard and the start button would popup. But now I have a new laptop that came installed with Windows 8 so you can imagine without the start button pushing the Windows button takes me to the tiles screen, which is doubly annoying. I prefer using fullscreen because I don't like seeing the navigation bar unless I need it. Computer screen real estate is precious, every pixel count. 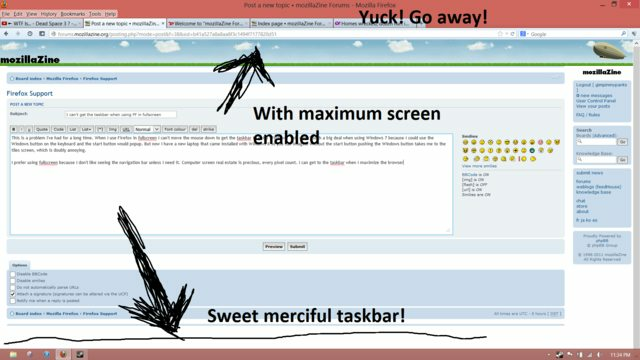 I can get to the taskbar when I maximize the browser but not on fullscreen. I can only imagine this being intentional since the problem has existed for so long. Any assistance would be great. Thanks. Last edited by James on February 11th, 2013, 12:52 am, edited 2 times in total. Reason: edit: made image as a large thumbnail link as it was way too big for img tags at 1,920px × 1,080px and broke format also. I do hit F11, Reflective. That's where my problem begins. In fullscreen I am unable to bring up the taskbar by bringing the mouse arrow down to the screen. KWierso, I didn't know about Alt-tab. It's not a perfect solution, but it's better than having to go to the tiles screen on Windows 8. Any other solutions? Firefox devs, any chance of fixing this problem? I think the way it works now is as it was intended to work. Fullscreen literally meaning Firefox is the only thing on the screen. I guess I could see it acting like the top section of the browser, where if you move the mouse up to the top of the screen, Firefox's interface slides down. But what about the people that move the taskbar to one of the other edges of the screen? Thanks for the info, KWierso. I sent in a request to Mozilla, lets see if one day it happens. Just a little more info... and based on number 8's post... seems to be intentionally working that way... by MS. I've just tried full screen in Win 7 with IE, Firefox, Opera and Chrome and they all work the same way re: full screen, so can't see how OP ever got anything different??? The only extension that I know of that would autohide the Windows Taskbar was the KrickelKrackel autohide addon. It gave the user complete control over all the toolbars in full screen. Unfortunately the dude has completely abandoned it and he even deleted his website so it's impossible to download it any longer. The final version 2.21 still works in the latest nightlies minus the floating toolbars. If you google it someone might have it to download. I too would like such a feature to make the taskbar visible in Firefox F11 Fullscreen mode. The feature could be made available as an option to keep Firefox more or less exclusively fullscreen. Doesn't hurt and gives quick access to the the taskbar with the mouse for those finding keyboard shortcuts (Alt+TAB) cumbersome. Based on what dfoulkes posted, it looks like MicroSoft "fixed" it for an edge case where someone MIGHT have the taskbar at the top. But instead of applying the "fix" to only the edge-case, they applied it globally. So they BROKE taskbar autohide in order to fix a bug that probably isn't even a real issue because I don't think in 20 years I've ever actually seen anyone purposefully put the taskbar on top. Apply appropriate rage in the direction of Redmond.